BONE Structure®, designer and builder of luxury custom homes using a patented light steel frame building technology and integrated process has broken ground on its first California net zero-energy project. The Laval (Quebec) Canada-based company with US operations managed from San Francisco, began assembly last week on the 3,200 square foot home in Stanford, CA that will meet California’s 2020 Zero Net Energy (ZNE) new home building requirements. BONE Structure homes can have a very large open plan interior space and double height ceiling allowing for natural light throughout and future reconfiguration is simple as needed. The home’s shell produces near zero waste, is made of 89 percent recycled steel, and is 100% recyclable, seismically resilient and safe from damage by termites and mold. 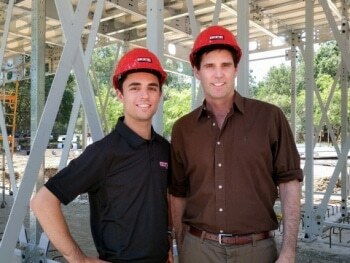 “This is a great first project for BONE Structure in California and a perfect example of the benefits of our system,” said Charles Bovet, Vice President of BONE Structure, U.S. “Stanford is an academically and environmentally focused community and a perfect location for our first net zero home. Our shells are net zero ready, meaning they are extremely energy efficient and with the addition of a small solar system they can produce more energy than they consume,” he said. BONE Structure creates custom homes built from columns and beams that are laser cut in a manufacturing plant and delivered to the site for assembly. A licensed BONE Structure assembly crew of five workers will assemble the shell of the home in days, each using battery powered drill, and one type of self-tapping screw to secure the steel columns and beams in place. Electrical, plumbing, heating and ventilation systems are easily connected thanks to precut openings acting as “highways” within the structure. Precut insulation panels clip into place between the steel columns and polyurethane foam insulation is sprayed on the exterior that tightly seals the building and acts as a vapor barrier. Together, the steel structure, insulation panels, spray insulation, and the roof create a tight, energy efficient envelope. BONE Structure expects to build 50 new homes in California in 2016. The company is scaling up to produce 1,000 residences per year to address growing demand for this disruptive home construction technology making it the only net zero-ready energy builder that can produce homes on a large scale. What a fantastic endeavor. Mark, thank you for leading the way! Let us see the finished product once your home is complete! The opinions expressed here are the views of the writer and do not necessarily reflect the views and opinions of AZoBuild.com.